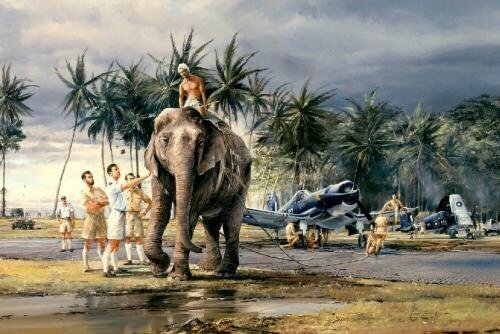 Commissioned by one of the Corsair pilots stationed at HMS Rajaliya in 1942, Robert Taylor’s superb painting Puttalam Elephants is one of many originals by Robert hanging in the wonderful art collection of the Fleet Air Arm Museum at Yeovilton. Much admired by tens of thousands of visitors each year, this painting depicts the unusual tactics as employed at Puttalam in order to keep the land based naval fighters flying. Operating happily in conditions where towing tractors became quickly bogged down, the Puttalam Elephants provided an invaluable service, and became much loved by the pilots and ground crews. Collectors will be delighted that we have arranged to publish this much-admired painting as a strictly limited edition. Prints, signed by Royal Navy Fleet Air Arm fighter pilots who flew the F4U Corsair have added further significance by signing each print in the edition. THE FLEET AIR ARM FOLIO have been signed by five of the Royal Navy’s most distinguished fighter pilots. There are a total of EIGHT signatures in this edition.